Volleyball hand signals and tips for better officiating. 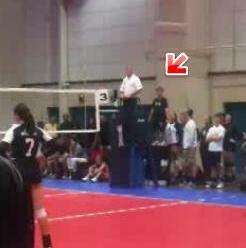 Volleyball officials need to clearly indicate the stop and start of play. Also, referees indicate infractions of playing rules and recognize requests for game interruptions. The combinations of whistles and volleyball hand signals enables referees to maintain a smooth flow to the contest. This allows spectators and participants to understand the action during the match and the outcome of each rally. Signals are your language as a referee. Your signals are your language and if you have a great command of that language, then it will show your expertise, your knowledge of the sport, your understanding of the rules, your confidence, your fairness, your control of the match, and your professionalism. You want to get to the point where your volleyball hand signals are automatic, but not robotic. You may need to adjust your signals to best fit your stature. This may be something you need to experiment with senior referees in your area. This expertise will only occur with repetition. Practice in front of a mirror and live match situations. Whistle immediately when a fault has been identified, or the ball is otherwise out of play. The whistle stops the rally and draws attention to you. The whistle indicates you have something to communicate. The whistle should be blown with authority and should be loud and crisp. Be sure to use a good quality whistle that can be heard over the participant and spectator noise. Vary whistle tones. Use different tones and volumes for different situations. For common play-ending situations and faults, usually best to use a louder whistle. For game interruptions such as a substitution or timeout, usually best to use a longer whistle tone. Multiple quick whistles are commonly used to stop play for game interruptions such as an injury or errant ball on the court. Especially as a second referee you may want to increase the whistle tone to get attention when attention is elsewhere. Whistle, award the point, signal the nature of the fault. 1. Blow the whistle. As a first referee, when you see the ball is out of play or there is a fault, always whistle first. 2. Signal which team wins the point. This signal shows the teams which team will serve next. 3. Last, show the fault signal. As a second referee, there are specific faults to whistle. As a second referee, the signal sequence is different. First, use the hand signal that corresponds to the fault you whistled. The first referee will then confirm your decision, award a point and signal which team will serve next. As a second referee, you repeat that signal. When a signal requires only one hand, use the hand that corresponds to the side of the team at fault. Always use the hand or arm on the side of the team that committed the fault. Some signals require you to indicate the player at fault. Use an open-hand gesture. Blow your whistle loudly to stop play. Award the point by indicating the next team to serve; hold that signal briefly. Show the fault and if necessary, the player at fault; hold the fault signal briefly. Late whistle. Since the whistle is the first step in the signal sequence, make sure the whistle is blown immediately when a fault has been committed or when the ball hits the floor. Don't hold your whistle if you are unsure of the outcome. For example, as soon as you see the ball hit the floor, blow the whistle. Worry about whether the ball was "in' or "out" later. Always blow the whistle first then look around for assistance. Simultaneous volleyball hand signals. Don't blow the whistle and signal at the same time. This is confusing for both players and coaches. Always use the 1-2-3 method for your signal sequence. Double signaling. Don't show two different signals for the same fault. This will also confuse people and make you look uncertain of your call. A good example would be a ball touched by a player and landing out of bounds on the same side of the net. The correct call would be "touch", not "touch" followed by "out". Too casual or exaggerated. You don't want to appear disinterested in the match. People may view you as unprofessional. If you're exaggerated or demonstrative, you may appear to be overbearing. Too high or too low. Too high signals will look odd and uncomfortable. Too low will be hard to see. Don't signal in front of your face.